Britain, Anglo-Saxon, ca. AD 700 to 750. Frisian sceattas. Mint : Continental type minted in Frisia but used in Britain. Size : 10.4 x 11.8 mm. Weight : 1.15 grams. Grade : gXF (nearly as struck). Obverse : Crude crowned head with the only features clearly visible being the cheek and ear, with Pseudo-runic inscriptions in front. 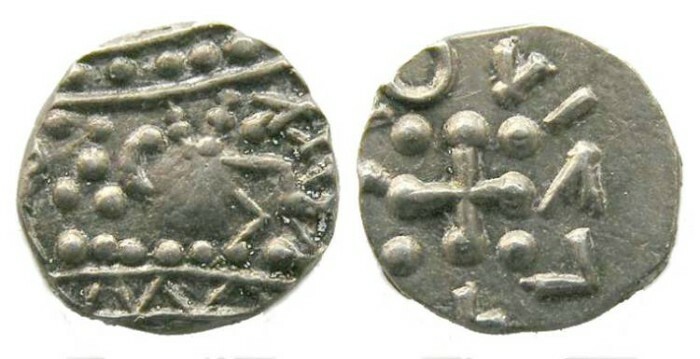 Reverse : Plain cross, with pellets in angles, with a Pseudo-runic inscription around. This type is listed with the British coins because, while minted on the Continent in Frisia, these are found in large number in Britain.